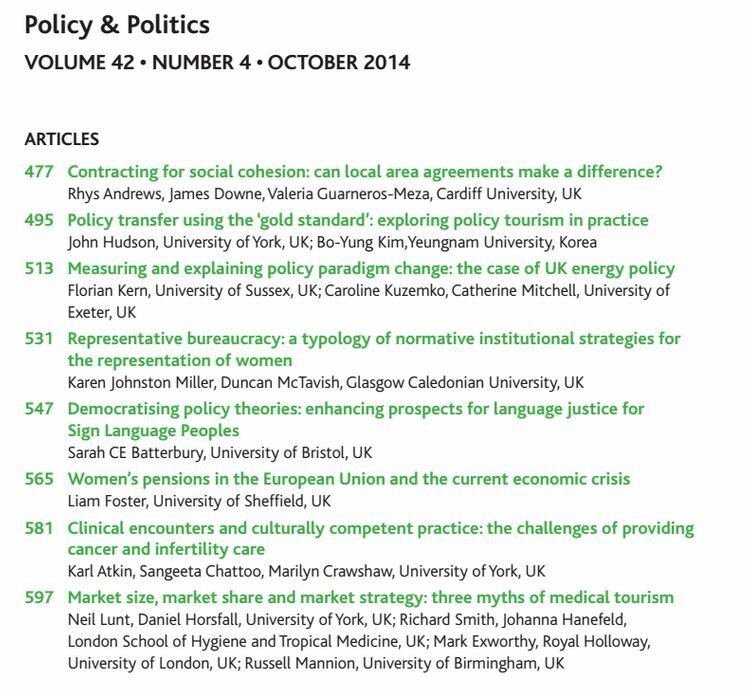 The October 2014 issue of Policy & Politics is now available in print and for download. The issue is an eclectic mix of the latest research and analysis covering a range of important policy process and analysis issues. Rhys Andrews, James Downe and Valeria Guarneros-Meza open the issue with an analysis of the impact of Local Area Agreements on social cohesion. They find that Local Strategic Partnerships with a Local Area Agreement for social cohesion experienced a better rate of improvement in community cohesiveness than those without, and that tougher targets resulted in stronger improvement. Hooking in to wider debates about target and public service performance, they conclude that ‘the evidence we present seems to indicate that performance contracts with tough targets for improving outcomes may be an especially effective way of making agencies responsible for dealing with wicked problems work together’. John Hudson and Bo-Yung Kim explore policy transfer through interviews with officials in South Korea. Their analysis, drawing on notions of ‘policy tourism’, suggests that ‘lesson drawing’ and ‘policy transfer’ are labels that are perhaps too strong for what happens in practice. Rather, it may be more apposite to instead consider the existence of a less direct and more general process of ‘policy learning’. Drawing on literature pertaining to policy paradigms, Florian Kern, Caroline Kuzemko and Catherine Mitchell analyse policy change in the energy sector. Their paper offers a critique of institutionalist approaches, and they argue that researchers might benefit from expanding their focus to include insights from the sociotechnical transitions literature to better account for paradigm change. Karen Johnston Miller and Duncan McTavish focus on representative bureaucracy, and particularly the representation of women. Using a four-fold typology of representative bureaucracy, they put forward a set of institutional strategies for the representation of women in public bureaucracies. A gendered analysis is also constructed by Liam Foster. His paper suggests the need to put women at the centre of discussions about pension provision, especially in a context of financial and economic crisis. A thought-provoking contribution on Sign Language Peoples (SLPs) is offered by Sarah Batterbury. This piece uses a perspective that incorporates ‘language justice’ within social justice, and calls for a democratisation of the policy process in order to give better outcomes for this group. Karl Atkin, Sangeeta Chattoo and Marilyn Crawshaw consider culturally competent care. Their article, informed by literature on cultural competence, ethnic identity, and the social consequences of cancer and infertility, offers a nuanced understanding of the interactions of health care professional and patients, and is highly relevant to practice. Neil Lunt, Daniel Horsfall, Richard Smith, Mark Exworthy, Johanna Hanefeld, and Russell Mannion examine the issue of medical tourism. In particular, they focus on three ‘myths’ by exploring primary and secondary data on the subject. In the coming weeks we will be posting blogs on the above articles from the authors themselves.